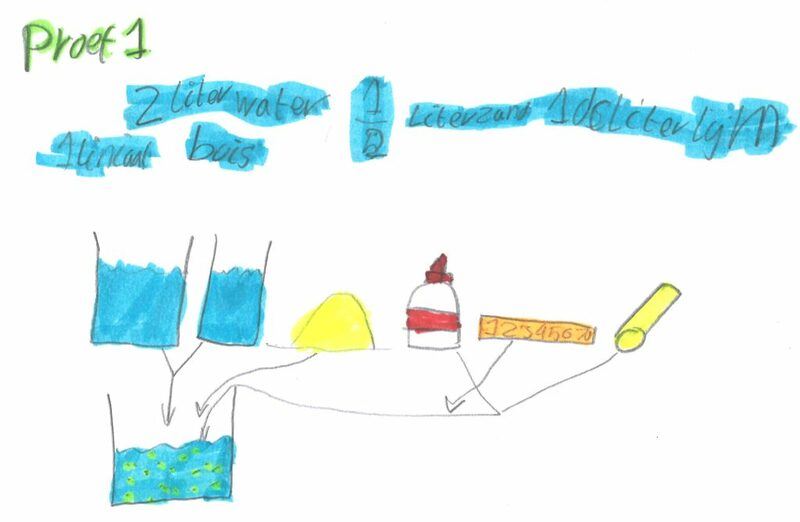 Design of an experiment to test a novel density measurement. Innovative ideas need an open mind, not hindered by trodden paths of thought that limit one’s ability to be creative. And whose mind is open and flexible enough to trust such a task? Children! In order to keep me sharp, I sometimes discuss tricky problems at the dinner table with my daughter. Lately I presented her with the problem of density measurement in a slurry pipeline. There is a well-known technology: nuclear radiation dissipation detection. But there are already two words in that concept that we are asked to replace with a safer and more environmentally friendly alternative1. Her solution was to measure how much particles would stick on a glue lathered rod held in the mixture flow. During one of my daughter’s holidays from school, we took the opportunity to test her novel concept. Preparations for the density measurement experiment. If this is going to be a novel measuring technique, we should prove, that there is a relation between the amount of particles sticking to the glue and the density of the mixture. This had to be tested in a controlled experimental environment: a bucket. We filled it with a known amount of water and by adding sand to it, we gradually increased the density. There were several types of glue to be tested, which we applied to short pieces of PVC tube. Glues we considered were: hobby glue, mounting kit, wall paper glue, contact adhesive and duct tape. There was one reference tube with no glue. 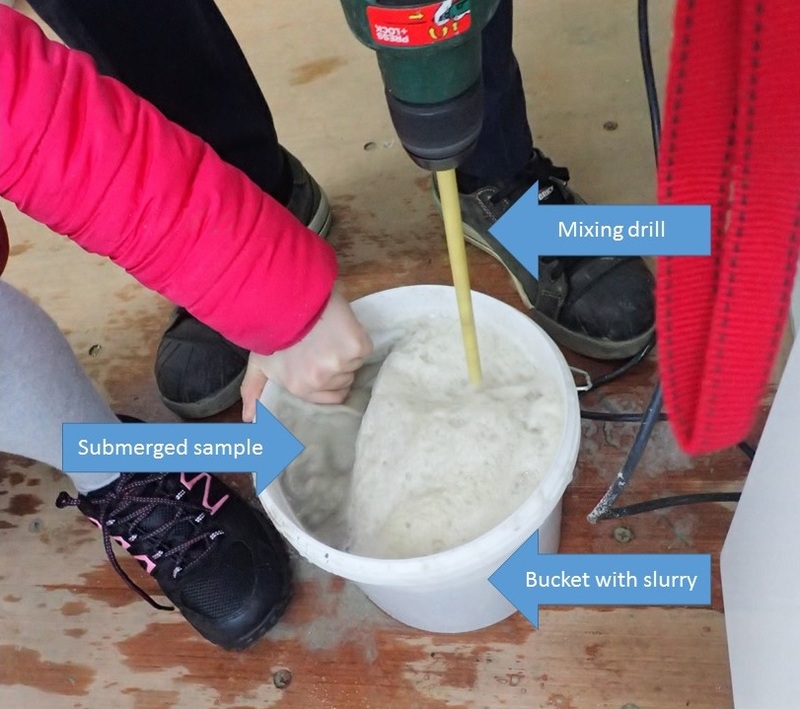 We kept the samples in the mixture for 30 seconds, while vigorously stirring the slurry with a mixing drill. Before and after the sample was dipped in the slurry, we measured the mass of the sample on a scale. The difference in mass should represent the amount of particles that stuck to the glue. These differences were recorded and plotted in a graph. Surprise! There is a distinctive trend in the data points that would support our hypothesis on the relation between mixture density and particle capture. Results of the density measurement. Some remarks on these results. There is a wide variation in trend lines. Some of the samples became lighter than they started. Probably, because they dissolved in the mixture. The measurements for the 600 and 1200 grams of diluted sand is notable. This is probably related to an observer variability. 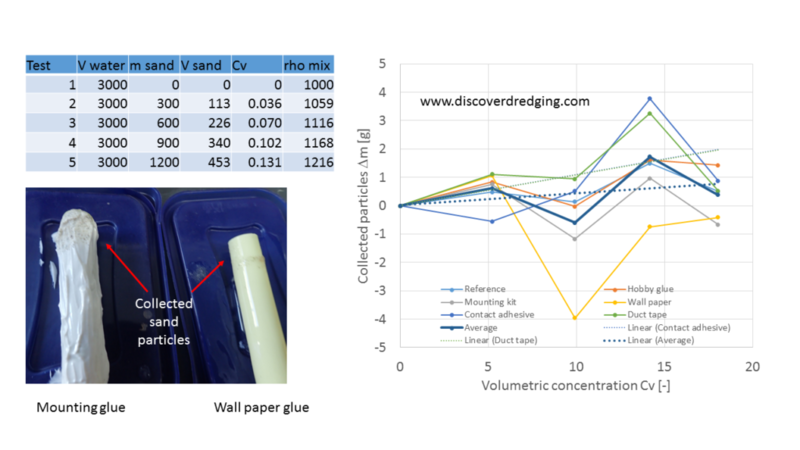 The strongest relation between mixture density and grain capture is with contact adhesive and duct tape. Interestingly, the best predictor for the average capture over the glue types was the reference tube. Probably, the water clinging to the tube already contained enough particles to result in a measurable signal. It was fun to do this exercise and the results are interesting. But, I doubt we can make a viable product out of this concept. 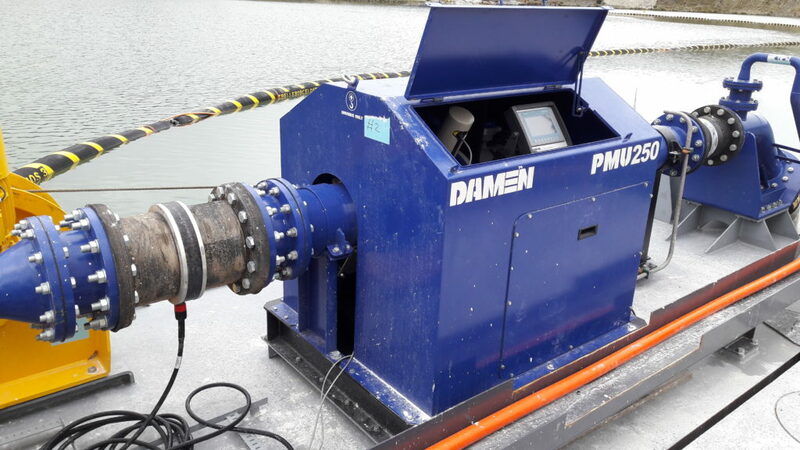 In the dredging industry, we prefer a non-invasive technology, the sample rod would be knocked out in seconds. Several manufacturers are already developing alternatives2,3. In our ¡VAMOS! project, we tested one concept, that seems very promising and you will definitely hear more about it in due time. It is time to say good bye to the nuclear density sensor and adopt technologies that are future proof. Our children will be grateful if we leave them a better world. Non-radioactive density measurement (Credit: ¡VAMOS! ).